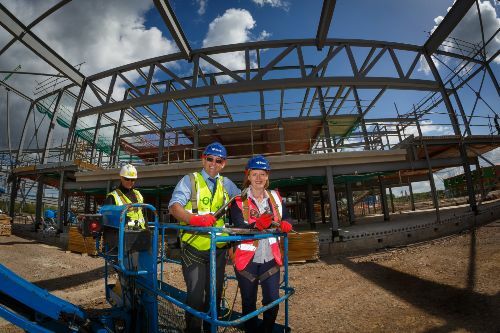 A 'last bolt' ceremony took place on Thursday 10th May at The Deanery CE Academy at Wichelstowe, one of the UK's most ambitious and pioneering senior schools, which is due to open in September 2019. The event was attended by the new Principal, Miss Linda Culling and Mr Andy Hamer, Capital Project Manager at the Government’s Education and Skills Funding Agency (ESFA), and representatives from BAM Construct UK. The ceremony celebrated the building of the new school reaching the final stage of steelwork construction and marks another milestone in the development of this exciting project. "The opening of the Deanery CE Academy is especially exciting and significant for Swindon, as it offers the only dedicated Church of England secondary provision in the town and surrounding area," said Miss Culling. Miss Culling added: “The innovative and challenging curriculum will nurture confident, secure, imaginative and selfless students. At the same time, the school will become the heart of the new community of Wichelstowe with regular events and the hire of sports facilities." The school will feature national-standard sporting, creative arts and educational facilities and will open for 210 Year 7 girls and boys growing year by year to a school of more than 1,400 pupils from Year 7 to Year 13. There are plans to open an adjacent primary school in September 2020. This is a new educational approach for a school, which will be unique in the Swindon area. It will blend a rigorous academic programme with a focus on the whole child and outstanding opportunities in sports, leadership, and the creative and performing arts. Through these activities they will learn key life skills such as communication, exploration, discernment and perseverance. The Deanery CE Academy is the newest member of the Diocese of Bristol Academies Trust (DBAT). The Trust was established in June 2012, with the aim of supporting schools within the Bristol Diocese who wish to benefit from greater independence, operational innovation, consistent school improvement and substantial cost savings through economies of scale. During the past six years, the Diocese of Bristol Academies Trust (DBAT) has grown steadily to comprise eleven schools across the region, with more schools planning to join. For more information, regular updates and registrations, the school has launched a website at www.thedeaneryacademy.co.uk.